The Ministry toolbox was created with your ministry in mind. 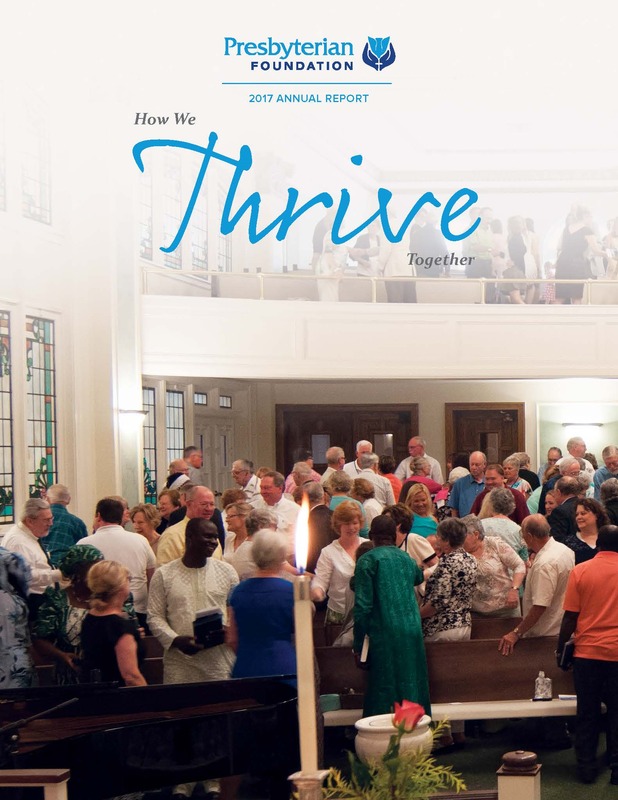 Browse through articles, bulletin inserts, leadership guides, and more to create a program for your congregation. A stewardship article written by Brian Fricke of the Presbyterian Mission Agency. Brian Fricke is the associate for Camp and Conference Ministries. This site contains stewardship resources from the Disciples of Christ. 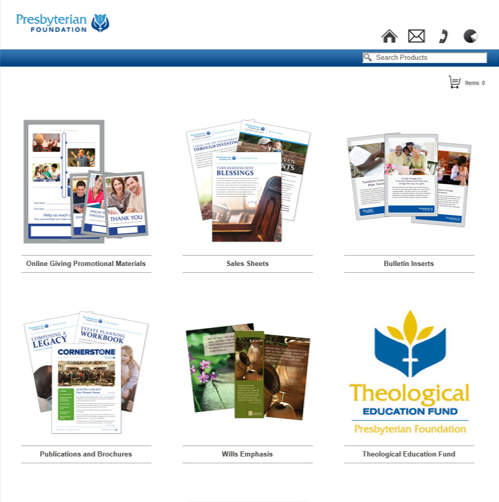 The Center for Print Resources houses Presbyterian Foundation information sheets, as well as pew cards, bulletin inserts, bulletin covers, and posters. 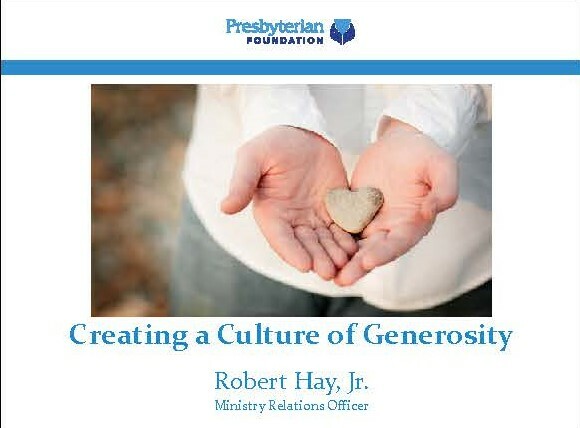 This presentation was used by Robert Hay, Jr., a Ministry Relations Officer of the Presbyterian Foundation and is a great reference for creating a culture of generosity within your church. Video: Karl Mattison discusses the nature of giving online or via text, and how to position your congregation or other ministry to receive the gifts available through these technologies. Echo Hill Presbyterian Church Shares their narrative budget. 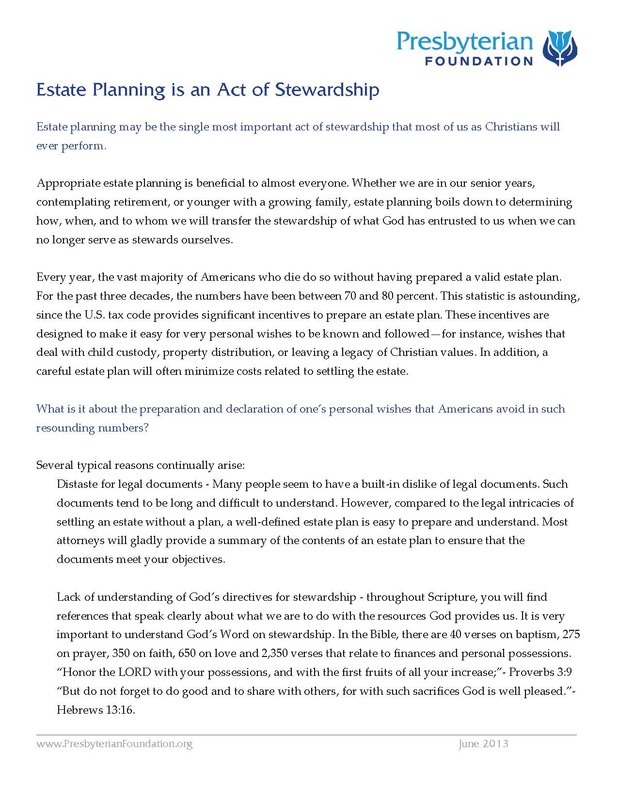 Estate planning may be the single most important act of stewardship that most of us as Christians will ever perform. 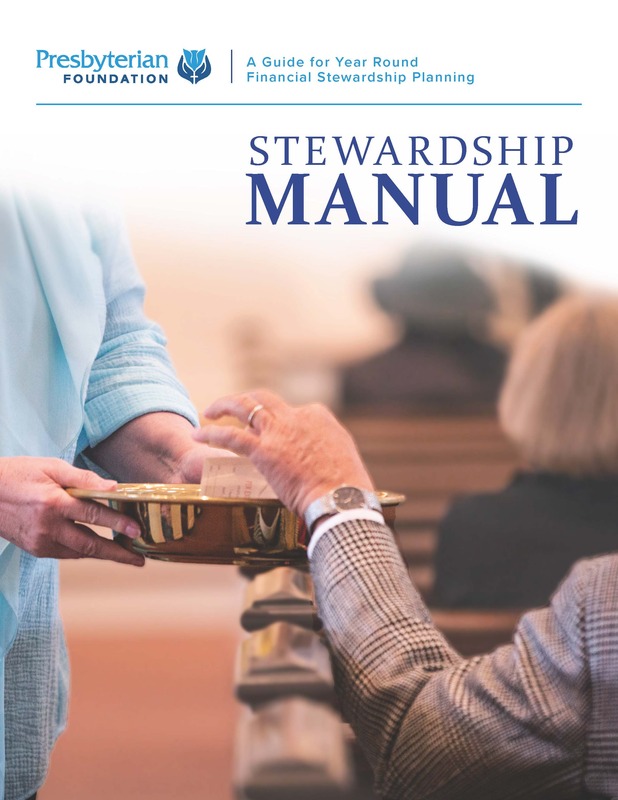 This helpful resource makes looking for a stewardship quote easy. Sample generosity team charter. Use it as a guide to forming your stewardship team. A stewardship resource for churches and denominations throughout North America. Research results and resource recommendation on faith and giving. Video: It exists - it is there - millions of dollars that can make a difference. It may be in the rainy day fund or your pocket or someone else's pocket. In this video, Lisa Longo and Charlie Spencer present ways to tap these resources, remove road blocks, and grease the skids to get money moving through the system to support mission and ministry. This piece outlines the ways in which you can give through the Foundation. 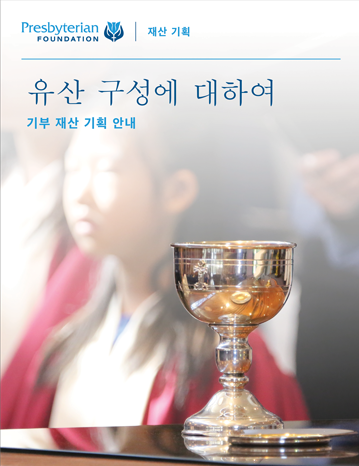 This piece, translated into Korean, outlines the ways in which you can give through the Foundation. 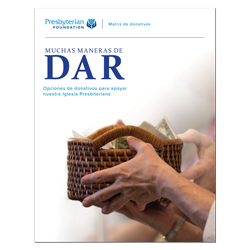 This piece, translated into Spanish, outlines the ways in which you can give through the Foundation. Rev. Ryan Baer of Ridglea Presbyterian Church in Ft. Worth Texas presents his insights on money and ministry as he sees it on is blog Decentlyoutoforder. Build a narrative budget for your organization. This sample from Church or our Saviour provides a great example of how to get started. 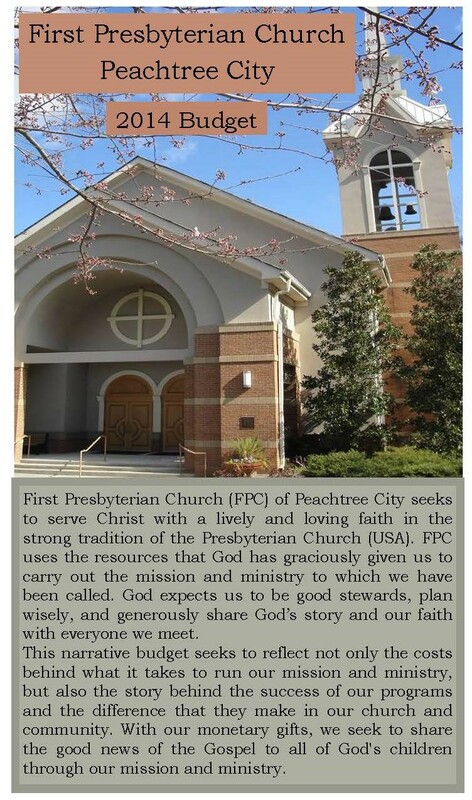 This is a Narrative Budget Example from First Presbyterian Church in Peachtree City, GA from 2014. This is the Narrative Budget created in 2017 by First Presbyterian Church in Peachtree City, GA that was provided as an example. This is a narrative budget template that can be customized to fit your church. Detailed instructions on how to use the template are also provided. 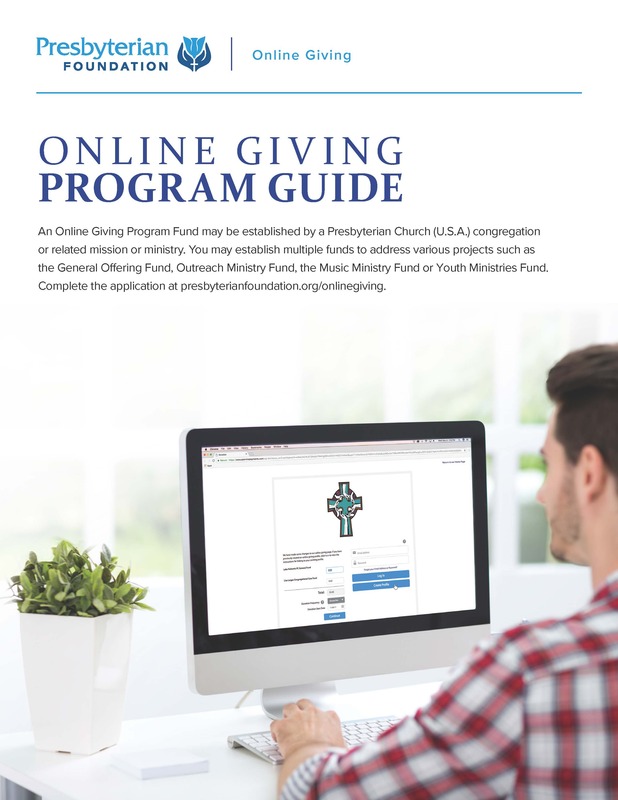 Review this piece for more information and how the Presbyterian Foundation can assist you in setting up an online giving program for your church. 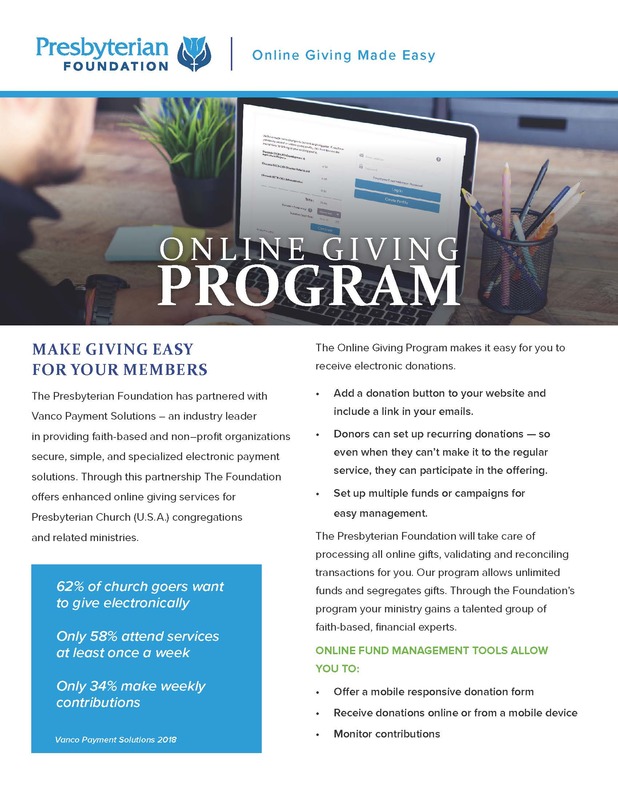 Use the Online Giving Program to make giving easy on your members. This is a custom Pew Card Sample used by First Presbyterian Church in Peachtree City, GA.
Introduction to the Foundation's program for transforming underused church assets for new ministry. Video: Stewardship and creating a culture of generosity take planning, practice, and persistence. Paul Grier teaches how to do an assessment and what the next steps are to keep moving forward. This is a tool for individual use in collecting important personal and financial information. This tool, translated into Korean, is for individual use in collecting important personal and financial information. This tool, translated into Spanish, is for individual use in collecting important personal and financial information. 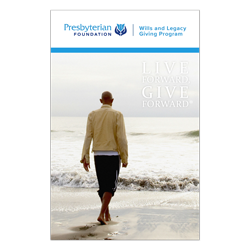 The Presbyterian Foundation is here to help – with two collections of sermons about stewardship and giving, delivered by some of the Presbyterian Church's finest preachers. These messages will inspire you and give you ideas for future sermons of your own. This video compilation contains the Stewardship Kaleidoscope 2017 workshops. A guide for year-round stewardship planning. This monthly e-newsletter brings you helpful ideas, best practices, and resources to make your congregation’s stewardship/generosity program the best it can be. 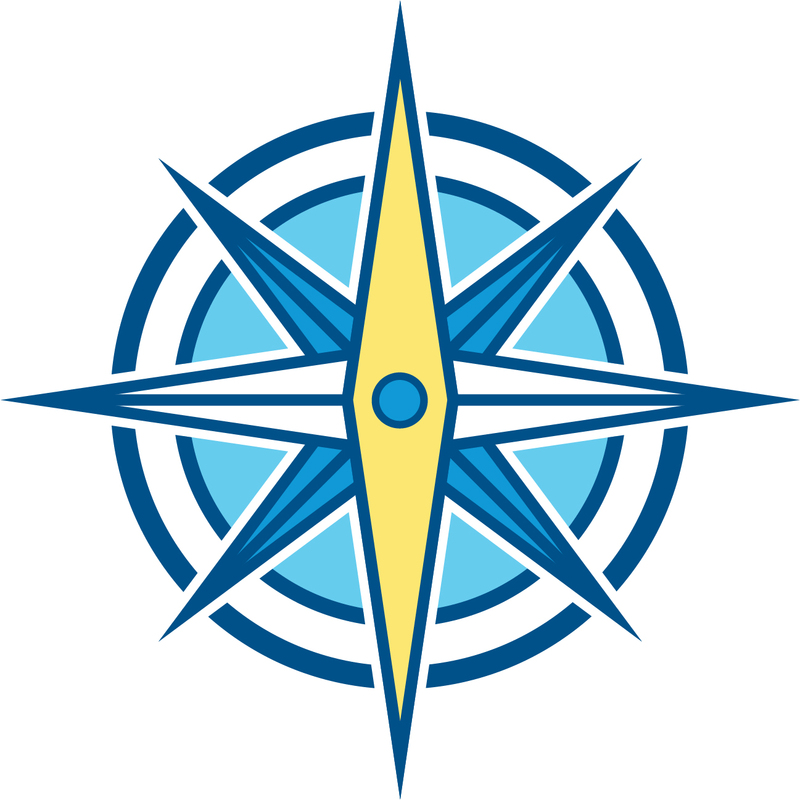 The Stewardship Navigator is a tool, provided at no cost to your congregation, to help you create a year-round stewardship program, along with customized materials for your congregation. This is an example timeline from Hudson River Presbytery. 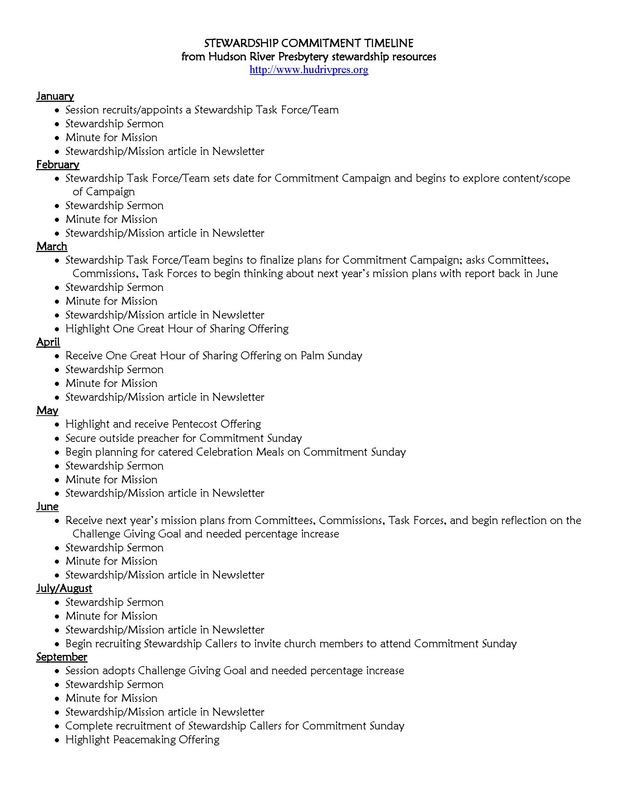 Annual calendar of activities that encourage generosity within a congregation. 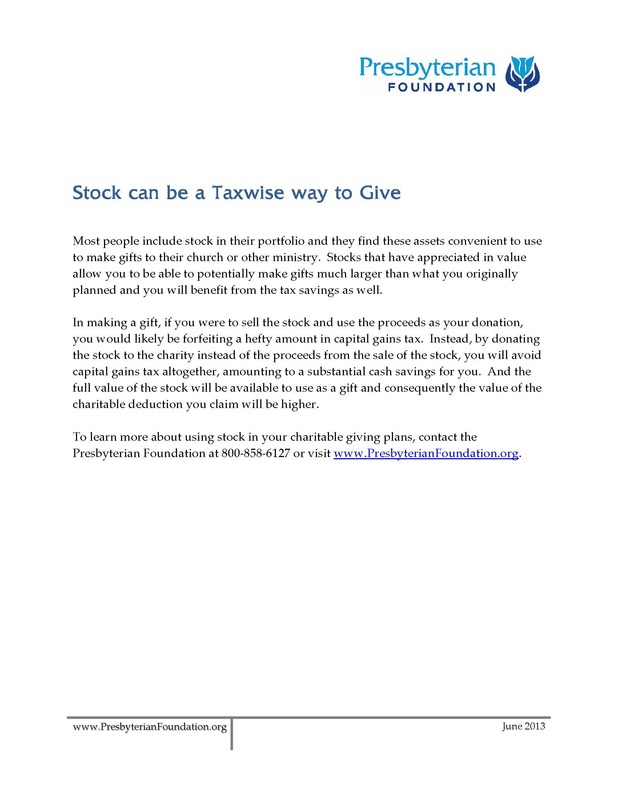 This brief but effective piece can be used to explain the benefits of giving through gifts of stock. Like it or not, the pastor either intentionally or not has a great deal to do with the whole congregation's approach to money - how much comes in and how it is spent - reflecting the church's priorities. Kevin Garvey and Terri Bate present in this video. 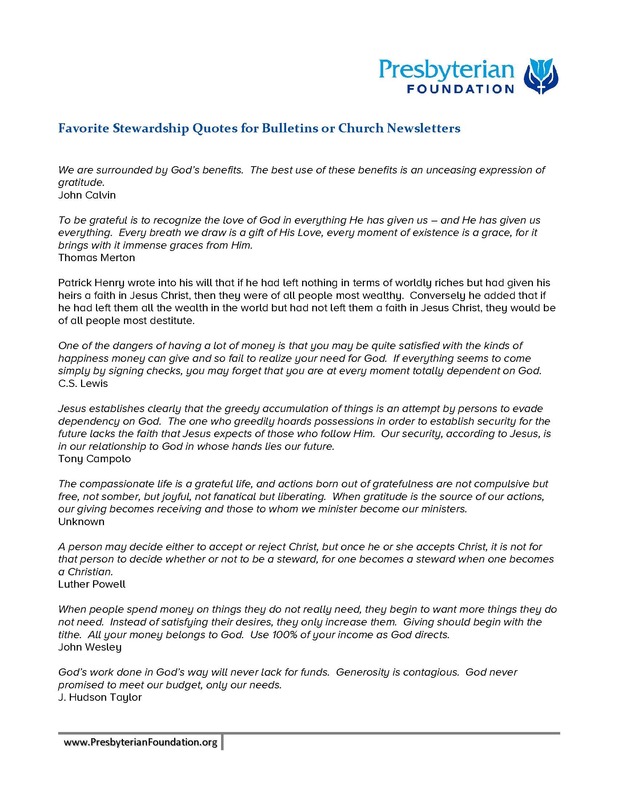 The site to order themed stewardship resources from the Ecumenical Stewardship Center. Sample materials for a stewardship campaign provided by Valley Presbyterian Church in Bryn Mawr, PA.
Video: Wycliffe’s vision is to see the Bible accessible to all people in the language they understand best. 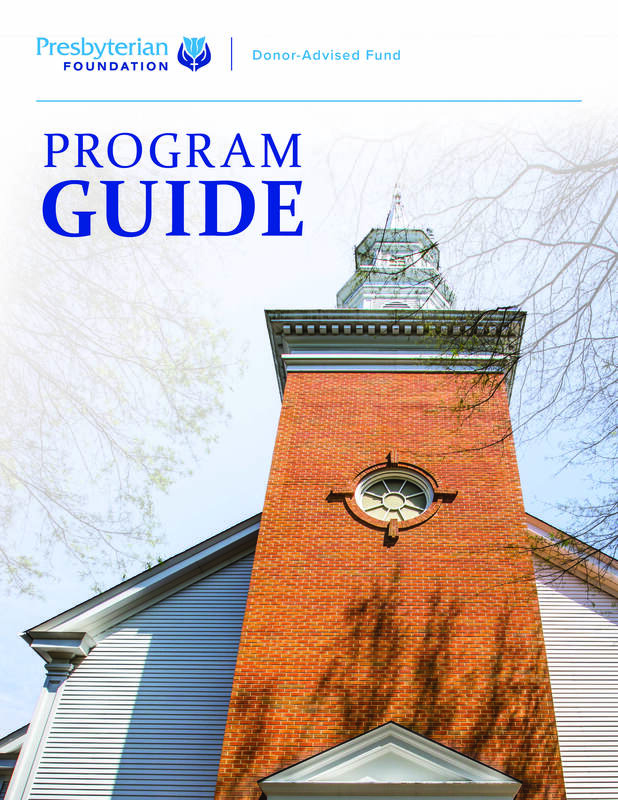 Zionsville Presbyterian Church lends their narrative budget as a guide for other Presbyterian congregations. Permanent endowments are important in supporting mission. 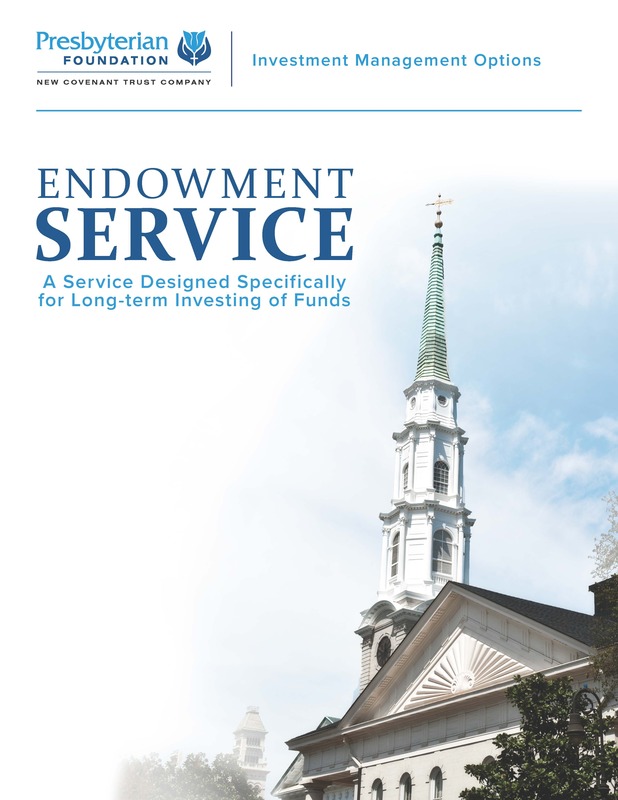 And mission activity is integral in determining how an endowment is structured. Tim Clark and Stephen Keizer demonstrate the impact of well-structured endowments on mission in this video. A faith-based family of mutual funds invested according to Presbyterian social witness principles. 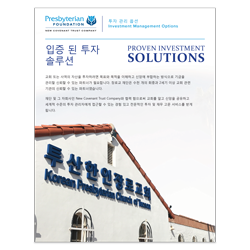 This brochure presents investment options from the Presbyterian Foundation and its subsidiary New Covenant Trust Company, and shows how they meet different needs based on the answers to those questions. Download this 8 1/2 x 11 insert, which explains the spending formula of the Presbyterian Foundation Endowment funds. Enjoy the freedom and flexibility to make grants from your fund when you want, where you want, and how you want. This is the application form to establish a Donor-Advised Fund. Outline for the Donor-Advised Fund and how it works. Start a Donor-Advised Fund for potential tax savings through bundling your charitable gifts. 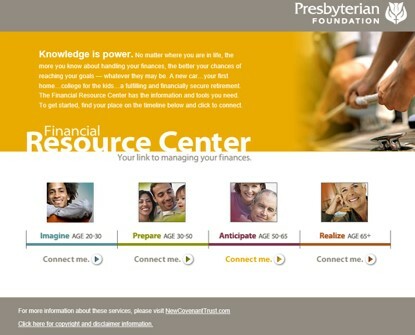 The Financial Resource Center has the information and tools you need to help you know more about your finances. 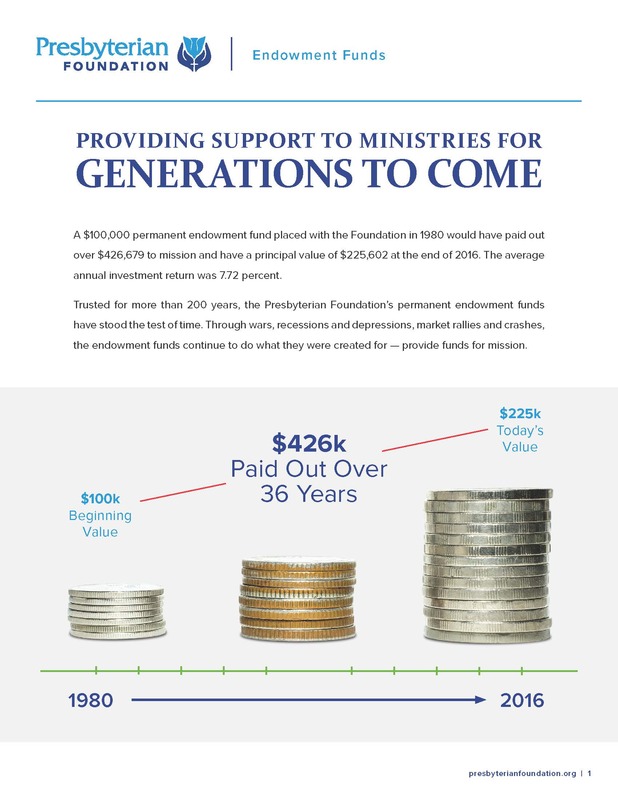 This brief article provides an informative overview of the services and benefits of a charitable trust through the Presbyterian Foundation. This 12-page booklet is an overview of many planned giving methods and is best used in conjunction with a planned giving workshop. 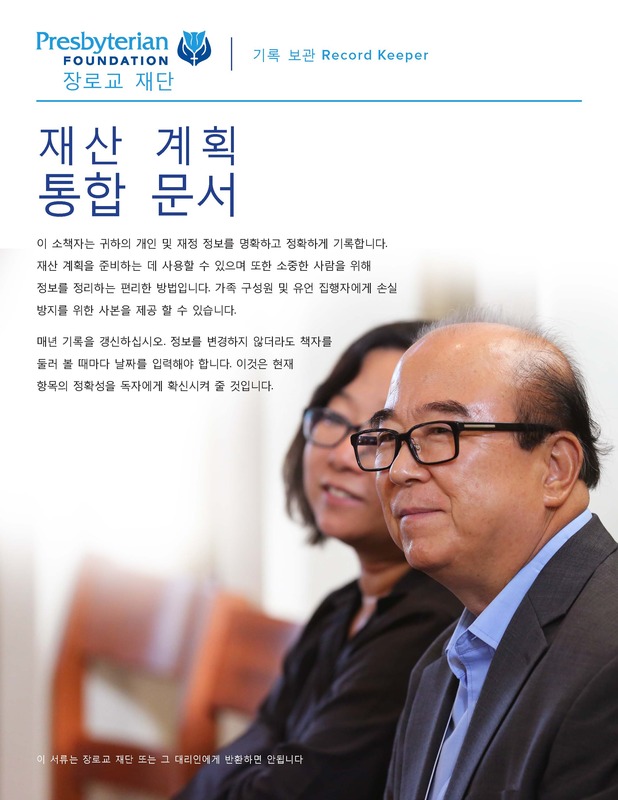 This 12-page booklet, translated into Korean, is an overview of many planned giving methods and is best used in conjunction with a planned giving workshop. Essential guide to establishing a Legacy, Planned Giving, or Endowment committee for your church. 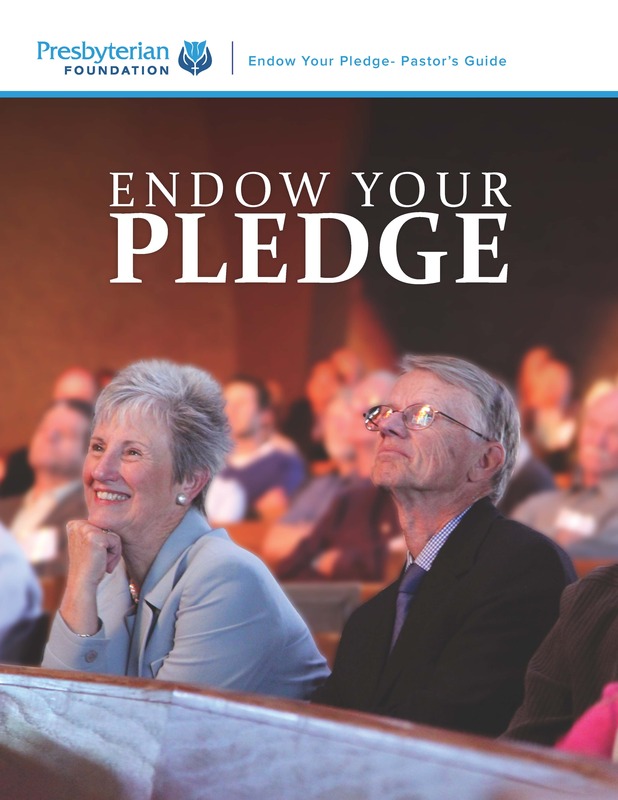 This piece outlines what it would take to turn your pledge into an endowment that will give on in perpetuity. 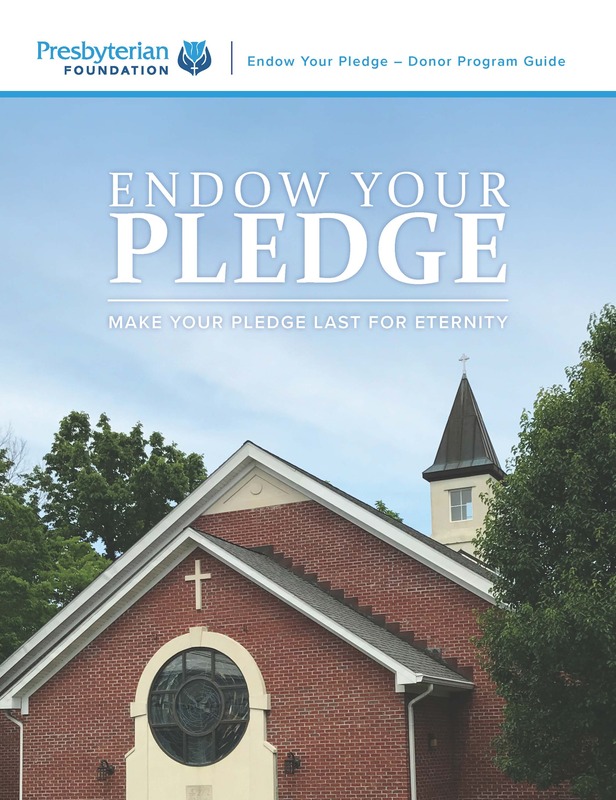 This piece outlines how a pastor should talk to their members about turning their pledge into an endowment that will give on in perpetuity. Resource for the planned giving or endowment committee at a local congregation to assist with attracting gifts. Video: Explore the spiritual underpinnings of giving and generosity. In this video, Jim Reese looks at scripture and its relationship to a variety of giving scenarios. 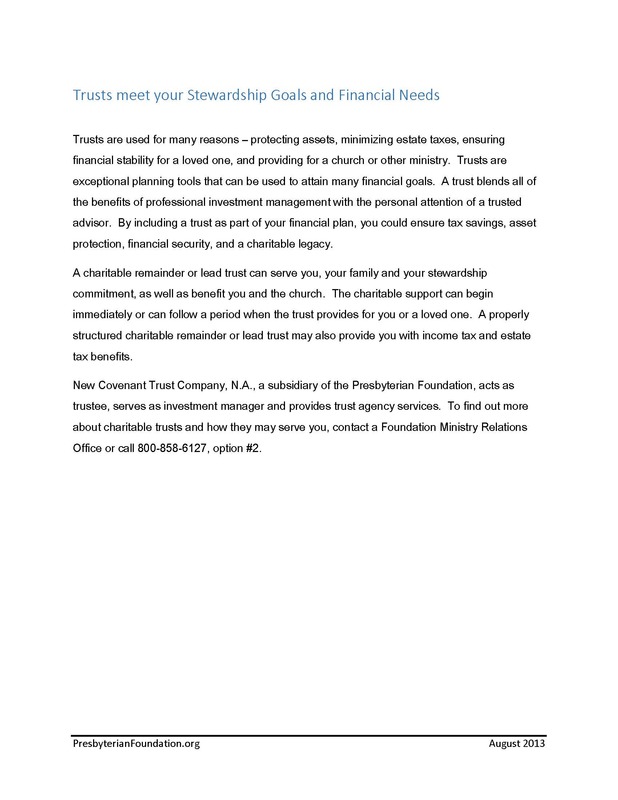 This one-page flyer describes Permanent Funds that may be established through the Presbyterian Foundation. 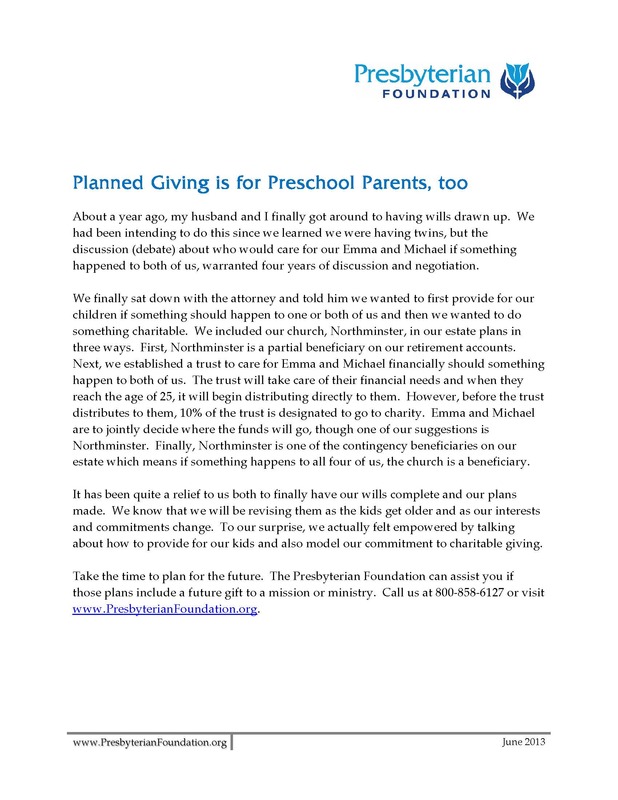 Sample story of a young couple planning their estate, establishing a trust that will provide for their children and eventually their congregation. An informative list of communications and events that will help you promote your wills emphasis campaign. 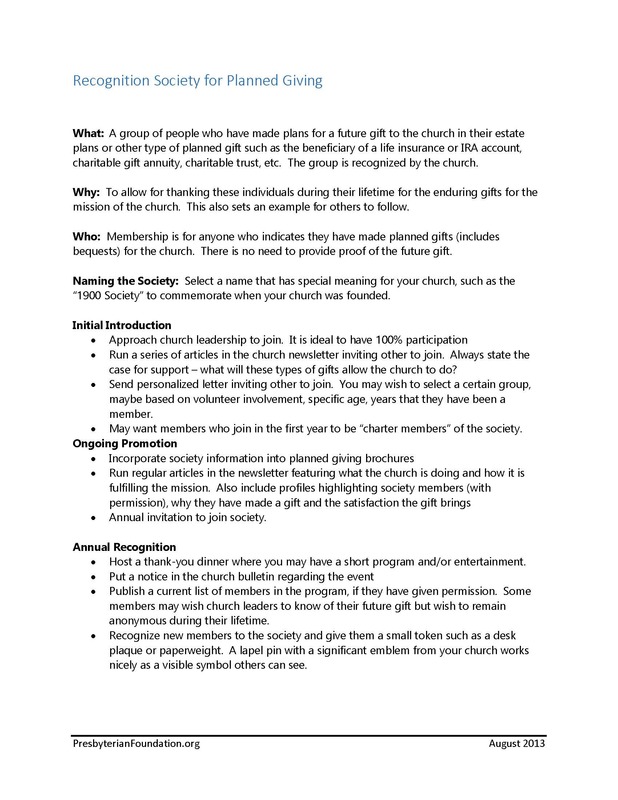 Use this guide when planning your church's recognition society. Information includes helpful tips ranging from introducing the program to how to keep it going. 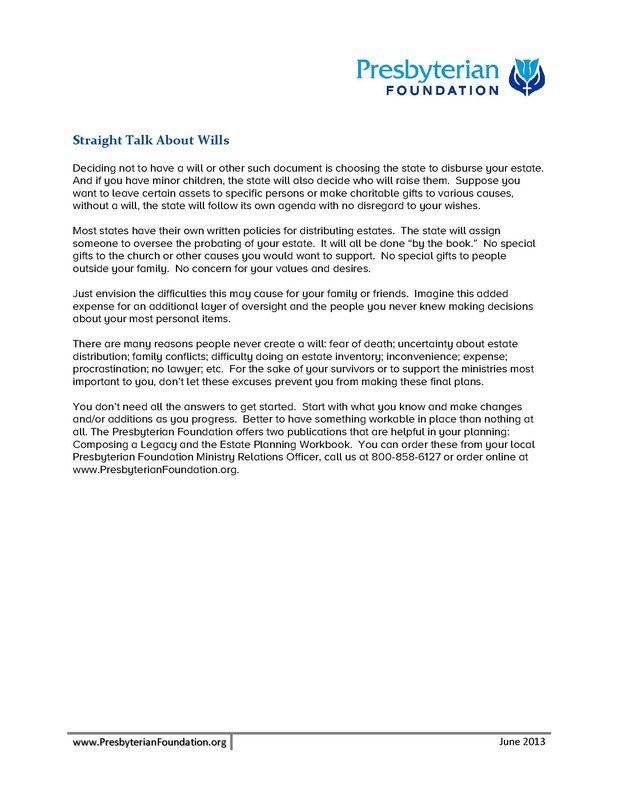 Outline for a candid discussion about thinking about your estate but not having a will. Read through this agreement and fill out the included application to start an endowment fund. 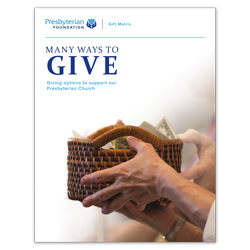 PEER provides resources that encourage Presbyterian churches and organizations toward best practices in gift planning and the use of endowments. 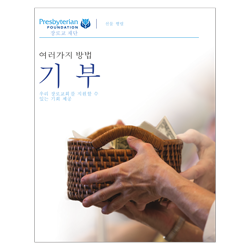 This brochure is full of information on the Presbyterian Endowment Service and how money is invested to be able to give for generations to come. Fill out this form to provide the following information substantiating the charitable beneficiary’s relatedness to a Presbyterian entity. Direct deposit of payments from a gift annuity, pooled income fund, or charitable trust to your financial institution is a safe and time-saving alternative to receiving checks through the mail. Fill out and send in this form to make a direct donation, or make a gift to an endowment or Donor-Advised Fund. Fill out this form to make a contribution to your Donor-Advised Fund. These forms are provided for those that already have accounts but that need to make a change to those accounts. Use this form to make a Grant Recommendation from your Donor-Advised Fund. Use the W-9 form if you are a recipient of income payments from trusts, pooled income funds, or gift annuities. You must provide the payor (the Foundation or NCTC) your correct Taxpayer Identification Number (TIN) for proper tax reporting, as required by law. Fill out this form to establish an online giving fund. For charitable beneficiaries that are not part of a governing body of the Presbyterian Church (USA), but are considered a validated mission, we require additional information to process the gift and to confirm the ongoing relationship of the organization to the Presbyterian Church (USA). 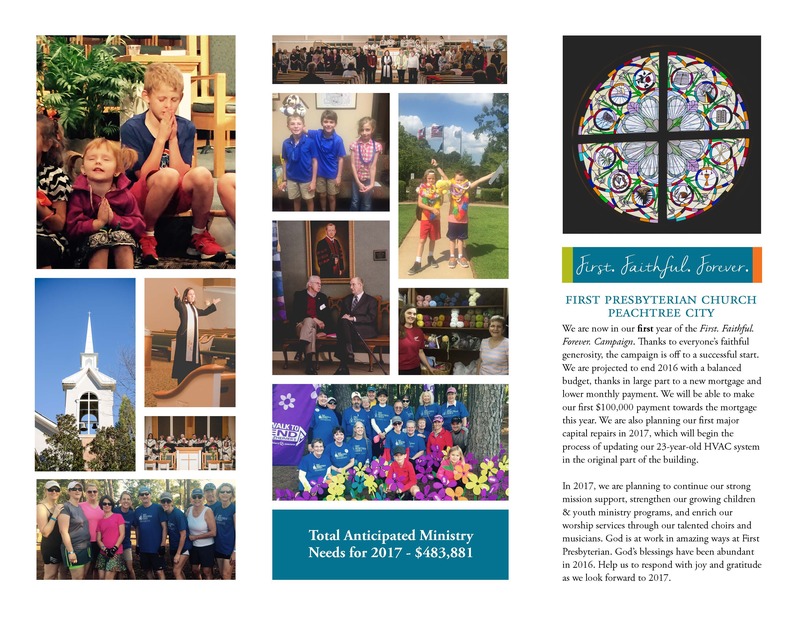 Please submit this form to adminservices@presbyterianfoundation.org. Use this form to notify us of any changes in your address, phone number or other contact information. This Trust Revocation Notification must be completed if the Gift assets are titled to a revocable trust. Capital Campaign Are We Ready? 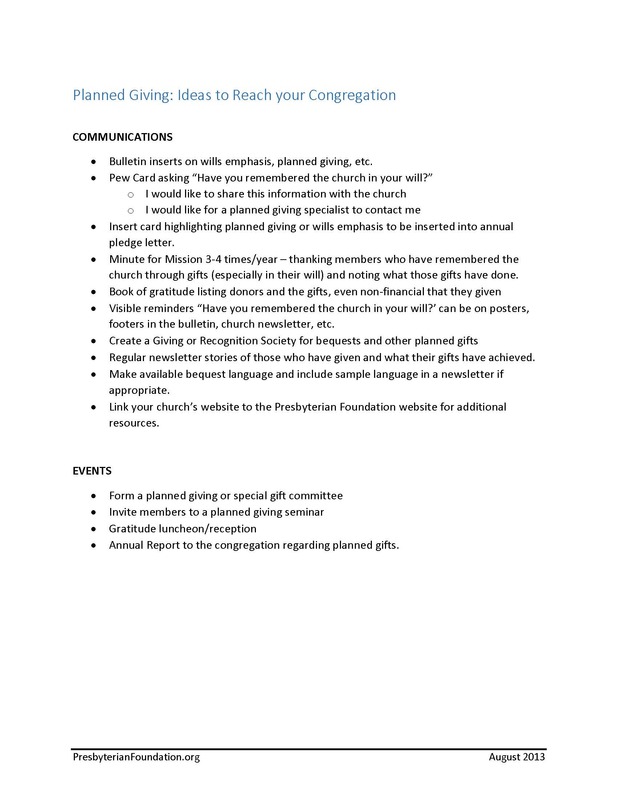 This checklist from Horizons Stewardship helps your Session consider the congregation's readiness for a capital campaign. This comprehensive resource provides a Biblical basis for capital campaigns along with guidelines for assembling a team and mapping out the campaign, and other helpful resources. Essential elements for successful campaigns, regardless of size. Video: Know the importance of giving back. Pastor of First Presbyterian Church of Jefferson City, MO encourages his congregation. 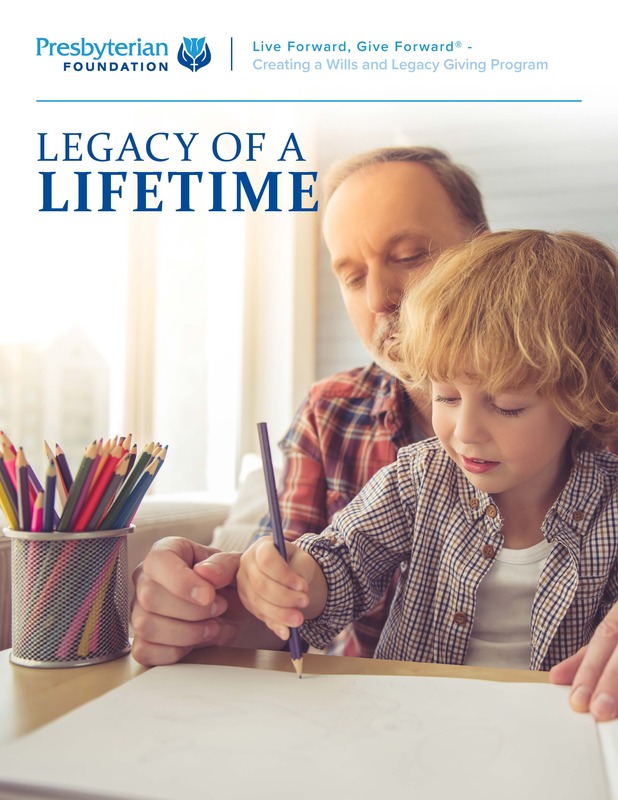 Bequest stories about actual donors who have left a lasting legacy to their church or mission. 8 1/2 x 11 Bulletin Cover. Download and print or order from the Center for Print Resources. Video: Pastor leads congregation's focus on community outreach and service. 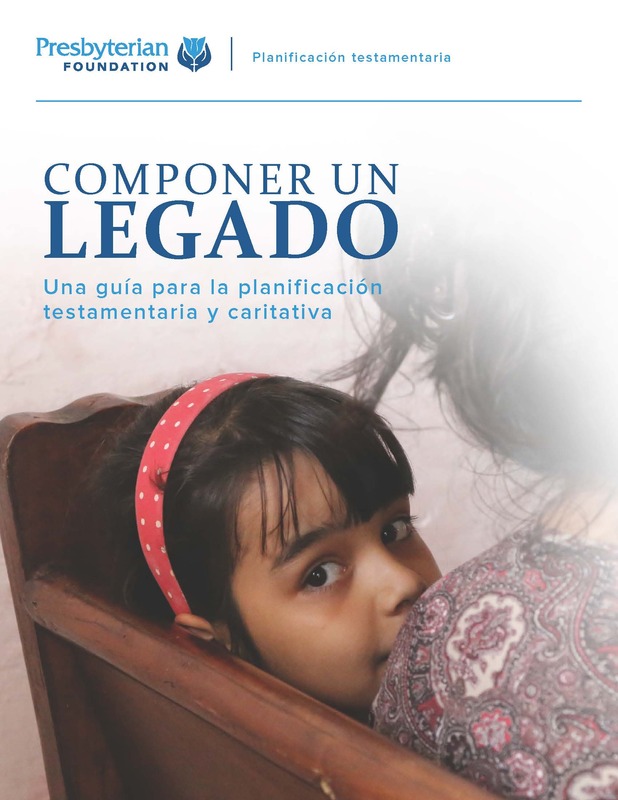 This 12-page booklet, translated into Spanish, is an overview of many planned giving methods and is best used in conjunction with a planned giving workshop. Donor makes a big impact on their church by leaving part of their estate to the church in this video. 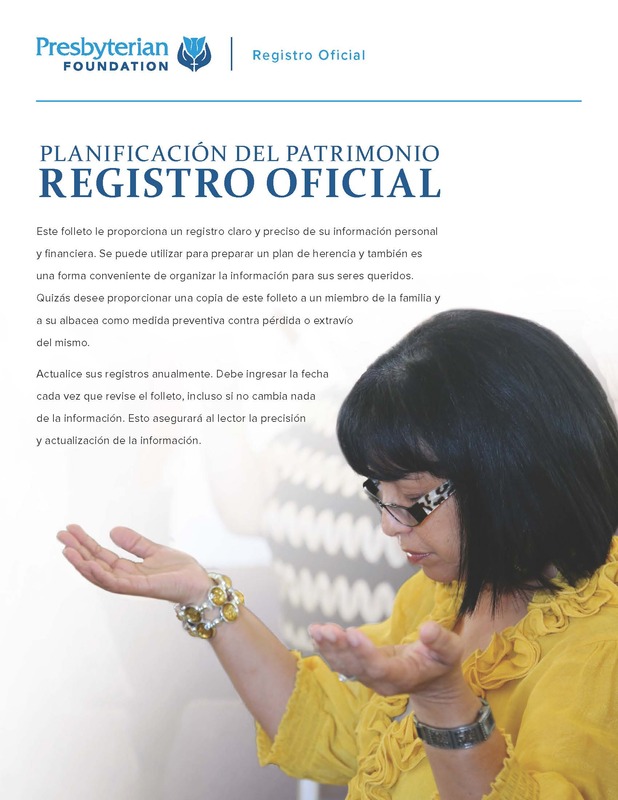 This bulletin insert can be used to promote a Wills Emphasis Program within your congregation. If you would like to order this insert already printed, you can do so through our Center for Print Resources. Sermon outline and support material built on Psalm 145:4, "One generation shall praise thy works to another." This assessment is designed to provide valuable insights and recommendations to help you maximize the attraction of God’s resources to further the mission of the church. The Foundation's Ministry Relations Program offers a variety of services to help pastors and sessions cultivate the funds needed to carry out their ministries. This e-newsletter arrives every two weeks as our gift to help your ministry. Each issue contains a brief reading, along with links to a helpful resource or video. 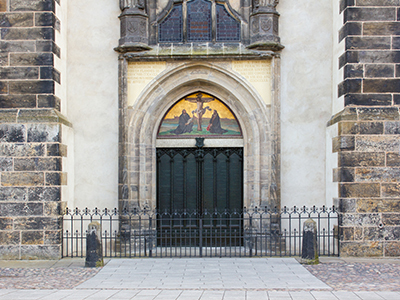 This resource includes videos and study materials over the 500th Anniversary of the Reformation. To download a PDF of the 2017 Annual Report, please visit the About Us page for a link. To request a printed copy, please fill out the Contact Us form.